The Jurewitz Law Group is proud to announce that founding attorney Ross Jurewitz was recently featured as the Attorney of the Month in the San Diego edition of Attorney Journal. The cover story titled “Excellence Every Step of the Way” showcases not only Ross Jurewitz’s dedication to providing exceptional client service, but also the firm’s ongoing growth and success in personal injury law. 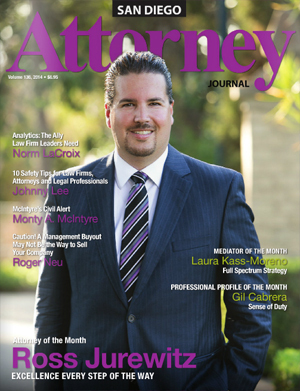 Attorney Journal is a monthly business-to-business publication that reaches about 10,000 private practices throughout San Diego County. Every month, the publication highlights only top attorneys and law firms in the county for their exceptional achievements, involvement in the local legal community, as well as charitable contributions and peer recognition. As a personal injury attorney for over 13 years, Ross Jurewitz has learned that a client’s experience throughout the legal process is just as essential as a successful outcome. “We want them to feel like they had an excellent advocate, someone who made them feel good through the process,” he told Attorney Journal. One of the keys to ensuring client satisfaction is education. By educating and guiding their clients through every step of the process, the Jurewitz Law Group allows each and every client to make informed decisions about their futures and to regain a sense of control taken from them by another person’s negligence. To read Ross’s five-page featured editorial and interview about his career and community involvement, check out Attorney Journal’s online monthly e-newsletter. Please join us in congratulating Attorney Ross Jurewitz for his remarkable success and well-earned feature by leaving a comment on our Facebook Page!